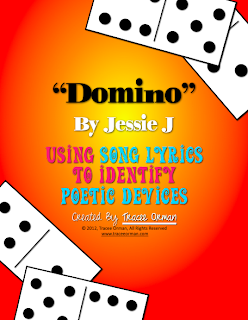 My latest is using Jessie J's song "Domino." It's another upbeat, get-you-ready-for-the-day type of song. It does, however, use the word "damn," so teachers will have to use their own discretion on whether they want to use it with their students. Also, the lyrics may be too mature for your students; I list it as 9-12, but you should look up the lyrics first and use your best judgement for your students. Because it is a priced product, it does include more than my "Firework" lesson. There are two separate handouts for differentiation: one will be more guided, asking students to pick out particular examples in each section. The other is more like "Firework," asking students to find the examples on their own. It also includes a list of the terms & definitions for students. You can project the page & have them copy them down, or give each a copy. A separate teacher's guide is included with Common Core alignment, directions, and a detailed answer key. Do you have any suggested songs for lessons? If so, comment below to let me know. *I actually have a a packet of songs that I paired with poems with similar themes to help students understand the meaning of poems, found here.